I am very happy and excited to announce that this TechEd I will be presenting along with my friend Jebarson. We will be presenting a session which will showcase the integration onWindows Azure, Windows Phone, Windows 8 Metro and Kinect. For the presentation we have developed a proto solution for Home Security. Well let me explain how we have put all these technologies into action. The Kinect device will serve as a watch dog at the home which is connected to the Azure. The device will be uploading patrol images to the Azure on regular intervals. Once there is a human intrusion detected, the Kinect will send a alert to the Azure and also will start streaming the live video to the Smooth Streaming Server hosted on Azure. Once the Azure, receives the alert, it will send a notification using Microsoft Push Notification Server (MPNS) to the subscribed Windows Phones and Windows 8 Metro apps where you can watch the video streamed live from the Kinect. 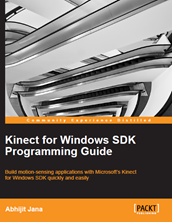 Well, that’s not the end, we will also demonstrate on controlling Kinect from Windows Phone / Windows 8 Metro app using Azure App Fabric. We will be discussing all the technologies involved and the architecture of the complete solution extensively along with a live demonstration in the TechEd.